Las Vegas will test the first self-driving public shuttle in the U.S. - Archpaper.com Las Vegas will test the first self-driving public shuttle in the U.S. Yet another unusual attraction has joined Las Vegas’ iconic downtown strip. ARMA, an autonomous, all-electric shuttle bus designed by French start-up, Navya, has been introduced to the city’s downtown traffic. 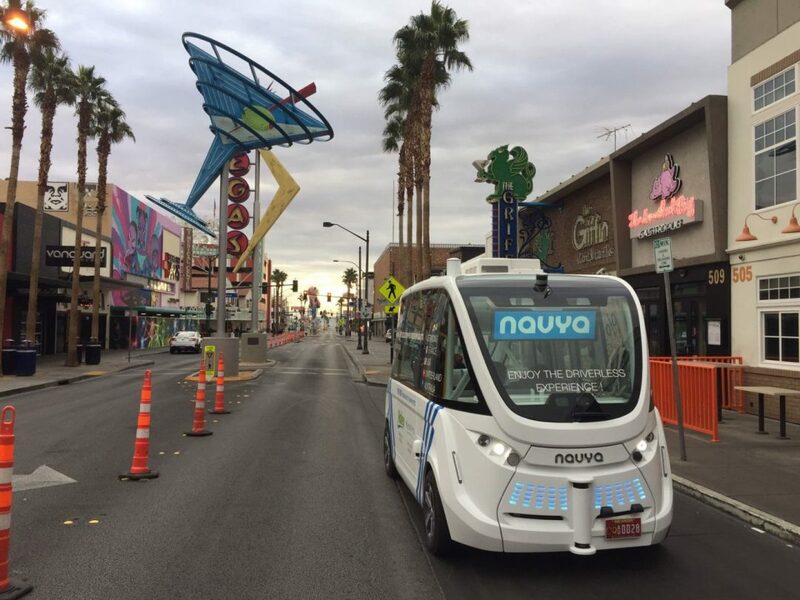 The pilot project, made possible through Las Vegas’ partnership with the mass-transit company Keolis and the American Automobile Association(AAA), marks the country’s first autonomous shuttle to operate freely within real-world traffic conditions. The bean-shaped vehicle carries eight passengers and is equipped with a computer monitoring system, GPS technology, electronic curb sensors, laser sensors, vehicle-to-infrastructure guidance and a variety of camera systems. Constant wireless communication between the vehicle and sensors set up throughout the area provide real-time information for ARMA to navigate its way through the bustling Las Vegas streetscape. While there are no steering wheels or brakes in the shuttle, an emergency stop button and a human attendant are stationed in the vehicle in case of emergency. Through the course of this year-long pilot project, the shuttle is offering free rides on a half-mile loop in the downtown Fremont East Innovation District of Las Vegas. The half-mile route has just three stops – located on Fremont Street and Carson Street between Las Vegas Boulevard and 8th Street – but is to-date the longest self-driving pilot project to operate in a fully-integrated manner within a real-world city environment. ARMA can operate up to 8 hours on a single charge, and reach a speed of 28 miles per hour. Over the next 12 months, the project aims to provide 250,000 free rides and help soothe public skepticism towards autonomous vehicles. In addition to familiarizing the public to these new technologies, this project will provide real-life research on the relationship between autonomous vehicles and pedestrians, bicycles and other human-operated traffic. Las Vegas will serve as a valuable test site for the future of autonomous transport within the urban environment. If Las Vegas can make it work, we can perhaps expect the expansion of self-driving technology on a broader scale throughout the country. Navya expects electric shuttles to be more affordable to maintain than combustion-powered vehicles. However, the cost of such projects are not cheap to install. Currently, a single Navya shuttle is estimated at around $260,000.